Prague is visited by millions of tourists every year and few realize that just a block away from the tourist traps are where the locals eat, drink and live. Imagine walking a block down a cobbled street and entering a completely different Prague. Away from the crowds of tourist. Away from the tour groups, clicking cameras and tacky gift shops. 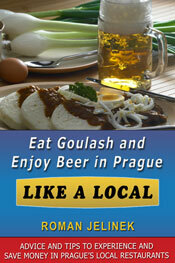 With Eat Goulash and Enjoy Beer In Prague Like a Local you can eat in local Prague restaurants. how do I know a good restaurant from a not so good restaurant? how do I get there via the metro, tram, bus, or taxi? how do I read the menu? what kind of food will they serve? how do I communicate with the waiter? should I be scared of locals? why should a man always walk into a restaurant first? Besides helping you get away from the tourists and experience the real Prague, this book will save you money. In a restaurant catering to tourists a pint of beer costs 100 CZK ($5.50 USD). A block away at a local restaurant the exactly same beer costs 26 CZK ($1.40 USD). This book pays for itself with a plate of Goulash and a single pint of Czech beer in a local restaurant! The author is a Prague local. Imagine knowing somebody in Prague who can advise you where to eat. 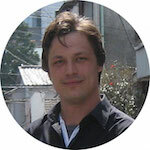 Informative and illustrated pages to enable you to visit local restaurants with confidence. In 2006 I packed my bags and boarded a plane for Prague. The plan was to stay for a year but I am still here because I love this city. After more than a few years living in Prague, learning the language and making lots of friends, I have progressed from a wide-eyed tourist to a goulash eating local. I eat out at least two nights a week in local Prague restaurants. Goulash is my favorite dish and of course no meal is complete without a half liter of world famous Czech beer. Eat Goulash and Enjoy Beer In Prague Like a Local is ready for your download right now for: $6.99 USD (Promotion price: 5.99 USD for PDF or Kindle). To get your copy, simply choose between the PDF ebook format or the Kindle format below. You’ll be taken to a page where you can make your payment and get immediate access for download. As soon as your complete your payment with PayPal you will be automatically sent to a download page and you will receive an email with a link to the PDF book. For your information: the Local Explore Kit includes this book in paper book and PDF format. It also includes maps and guides for Prague walks, restaurant recommendations, a small town daytrip, and a language cheatsheet. Simple. If ever you are not satisfied that this book helped you eat like a local and saved you money, just let me know and I will refund your money.